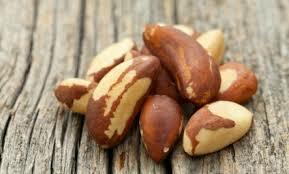 Brazil nuts have extremely high levels of selenium. This trace mineral helps prevent a whole range of inflammatory conditions like seborrhea and dandruff (although dandruff might not be considered an inflammatory condition.) The problem here is – do not eat one Brazil nut after another. I eat two or three a day. More than that may be too much of a good thing. A toxic amount of selenium is around 900 micrograms in a day. So do not even think about eating a cupful. Besides tasting great, these creamy nuts are a source of many vitamins too. They contain almost the whole B-complex, and many other vitamins that act as cofactors for enzymes important in metabolism. These nuts are naturally gluten -free, so people who are worried about gluten (celiac disease) can relax when eating them. I’m probably imagining things, but I think my skin looks healthier and my hair looks more lively since I started to eat these nuts in moderation. I buy them in bulk at Kroger supermarket and I keep them refrigerated so the oils in the nuts don’t turn rancid. Again, be careful – 100 grams of these nuts give you about 3500 percent of the daily recommended amount of selenium. Two or three a day is plenty.